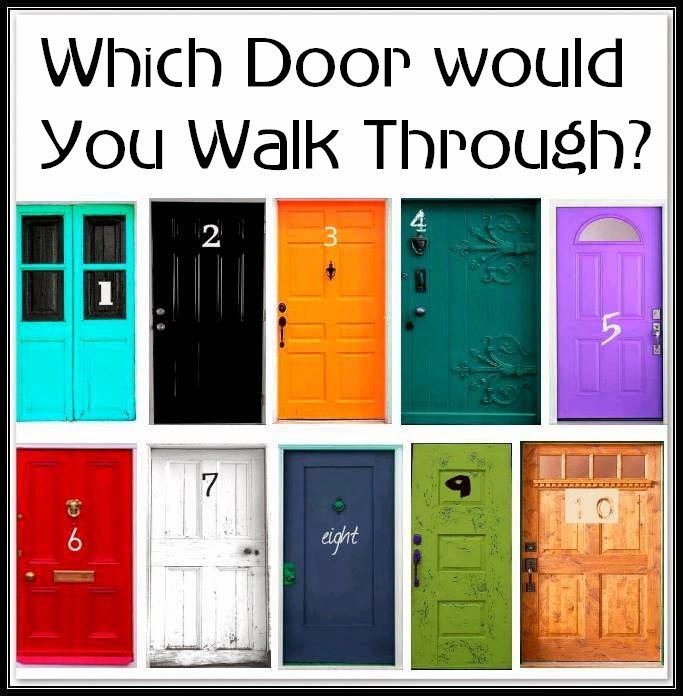 google-site-verification: google8d8438b214143f71.html Beautiful Quotes: WHAT DOOR WOULD YOU WALK THROUGH ? WHAT DOOR WOULD YOU WALK THROUGH ? WHAT DOOR WOULD YOU WALK THROUGH? Pick the door that looks the most appealing to you. This might reveal a few things about your personality. Let us know what door you picked and if the answer was accurate for you. Feel free to SHARE! 1 - You are a fun individual that likes to keep things light and airy. You are all about nurturing others and appreciating the simple luxuries in life; such as your fine dishware, favorite candle or eating artisan bread from the local bakery. You most likely have a love for traveling and other cultures. You truly want the best for everyone and love creating a welcoming atmosphere. It is important to remember that if you ever feel that you need help or support, it is OK to just ask someone. 2- You are clean and simple and don’t like any frills. You might strive to have a clean and perfect existence; but is it totally worth it? Don’t you feel that there is something missing? You are all about your personal achievements and you take pride in your work or career. Although you might be on track with your career path or have a few diplomas/ certificates on your wall, you need to spend more time on developing yourself as a person. Remember... the real you. Life is all about creating balance, surrounding yourself with color and creating memorable adventures. If you are finding that you have been taking the safe road lately, try veering off the beaten path. You might surprise yourself! 3 – It is obvious you are a quirky individual and very interesting to the people that you let into your life. You are good at many things... a “Jack or Jill of all trades”. You are an artistic individual that expresses yourself in many ways. You can make something out of anything and are not a stranger to your local thrift shop. You can basically make vintage “new” again. It is easy to get stuck inside the house or inside your urban bubble; but remember that you have to get out and connect with nature. It is time to come down out of the clouds and get grounded! 4 – You are an old soul that can be slightly dramatic. You are a very artistic person that loves to express yourself through writing, music, art or some kind of expression. You are a dichotomy; for you can be very open and friendly, yet closed and deeply private. You often have your guard up, keeping your thoughts and troubles to yourself. Although you might think that nobody will truly understand you, if you allow yourself to open up and share your feelings, you will feel so much better. Deep down you are not aright with any imperfections and you feel the need to come across as “the rock” in any group situation. Know that people are willing to share their feelings with you and want you to share your feelings with them. 5 – It is very important for you to fit in and feel as though you are a major contributor in every situation. You always have things going on, for being productive is what makes you feel at ease. Your busy-ness can sometimes cause the need for you to become more aware of what is really going on around you. What does your body want you to be doing? It is alright to relax on a Monday and simply just BE. Feel free to take some time to figure out what you really love to do. Possibly try some new hobbies or activities that are out of your normal routine. Explore being you, even if that means relaxing. Life is not just about how many muffins you can make in a single batch or how many fit-it jobs you can do in one day. 6 – You are a confident person with an eye for detail. You can come across as someone who is all together and exciting; yet you are just YOU on the inside. You care about your appearance and how the world sees you, yet the inside your home or car is probably a total mess! Your personality can be self destructive, for you could turn against yourself when the going gets tough. The life of a person who is a living a total contradiction... has got to be a difficult one. Remember to breathe and just relax. Life is not just about pleasing others. Truth is, the world isn’t always watching... Take time to reflect on who you truly want to be? What is it that you truly want to do? 7 – You are a simple minimalist that always has important things to do. You care for others and find your time anything but your own. You surround yourself with meaningful things, for you are very sentimental. Family and friends are very important to you and you would do anything for them. Not putting yourself first has made your life a safe and complacent one. What is it that can enrich your life today? What will make your life more colorful and enjoyable? Even though life gives you labels such as a mother, father, wife, husband, teacher, manager, etc; remember that your life is still YOUR life. Take a moment to decide what you want your future to look like. It is perfectly acceptable to want wonderful things to happen to you. Carpe Diem. 8 – Your fun and playful personality keeps you young and youthful. Although you are easy going, you tend to have lower self-confidence and anxiety about specific things in your life. You are usually unorganized; yet don’t even know where to start to help yourself to fix the messy problem. You are a proud individual but you need to learn to love yourself more. You need to take the time to find yourself through self expression. How are you currently expressing yourself to the world? Remember that there are people around you that can help you, but you need to let them know you are willing to receive help. Life is easier when you let people in. 9 – You are a quirky person that is always making things work. You are an amazing problem solver that prides yourself on your thrifty living. You like to live an uncomplicated life and usually get by with the basics. Why would you need anything else? You are very easy to please and love doing things for others. Whether it be fixing your neighbors toilet, building a bird house for your mother out of reclaimed wood or helping your friend find a great living room set at the thrift shop; you are always there to lend a hand. Remember that life is special. It is OK to treat yourself to amazing things. You are special too! 10 – You are one who truly appreciates stability and wholeness. You are a reliable person that takes pride in their love of quality and detail. Some might say “cookie cutter”, but you say dependable! You always know what you are getting because you have checked the consumer reports. You love safety and security in all parts of your life. You prefer not to have anything frivolous or extra, if you can’t see the use for it. Chances are you have some sort of creative side that you have curbed in some way. You might love scrap-booking, music or art; yet would never try to make it your career. You feel your problems are your own and nobody needs to be burdened with them. Just keep in mind that exposing your true self to the world (or your neighbors) is not a crime. We are all human.